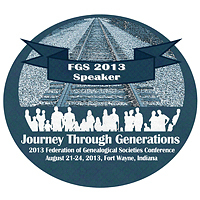 So… tomorrow is the big day — the official opening of the 2013 conference of the Federation of Genealogical Societies in Fort Wayne, Indiana. People have been arriving in Fort Wayne since the weekend, needing to be there early for meetings or to take advantage of the fabulous genealogical collection at the Allen County Public Library, right next door to the convention center. But the official opening bells rings tomorrow morning at 8 a.m. when Cyndi Ingle Howells (of Cyndi’s List) begins the society day by asking Is Your Society Website All It’s Cracked Up To Be? By the time you read this, if you’re lucky enough to be attending this year’s conference, you’ll either be in the throes of last minute travel or deep into your own library research. The one thing you may not have done, if you’re anything like me, is choose which sessions you’re going to attend the rest of the conference. So The Legal Genealogist has some suggestions. And somehow I suspect it won’t surprise you much that they all have something, in some way, to do with the law. Panel with Jan Meisels Allen, Jan Alpert and Frederick E. Moss. The draft 2011 Model Vital Statistics Act is already influencing changes in access to vital records. How can genealogists prepare and respond? Learn what genealogists need to know – and do – as a community and as individuals to help get and keep access to records we need. Modern research requires specialized skills, methods and resources. The importance of ethics when locating living people will be addressed. The laws governing the release of adoption information are unique to each jurisdiction. Learn about the various options and how to begin a search. A how-to guide for individuals and societies to speaking, writing and publishing while staying out of copyright trouble and protecting our own work. The Homestead Act has been called the most important act for the welfare of the people ever passed in the United States. Our ancestors’ marriages lasted longer than our own. One reason: divorces were hard to obtain. Records created reveal ancestors and the laws they lived by. As the views of society toward children evolved, the types of records and where these records might be located changed. Learn how German marriage laws changed between 1500 and 1900, about tight marriage restrictions, and the culture surrounding births out of wedlock. Property transfers (including slaves) at the time of death provide solid evidence of individuals and family groups. Learn to find these records and understand their practical use. Tax and land records provide clues to real lives when interpreted using laws of the time. Examples include Spanish and English influences and laws affecting women. Lots to choose from in Fort Wayne!